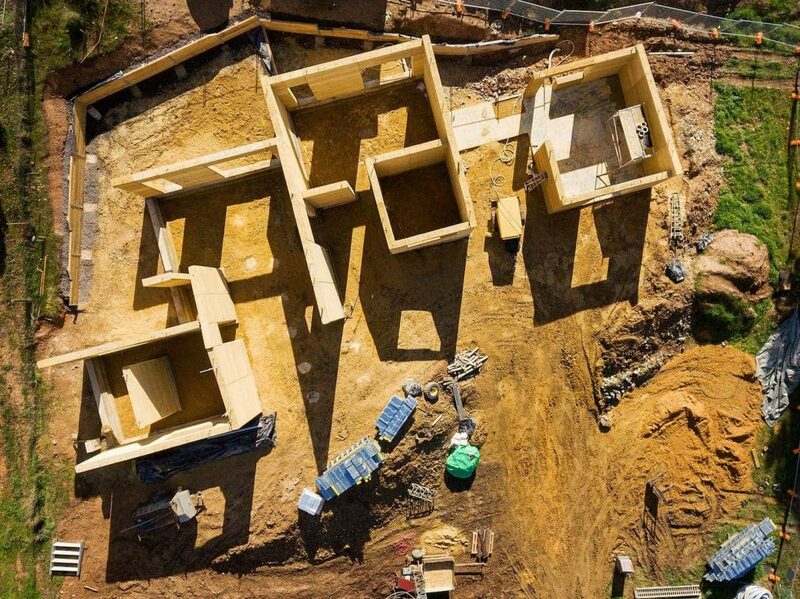 We construct rammed earth walls for new homes, extensions or landscaping. We can construct curved walls, internal thermal mass walls, feature walls or standard walls of any quantity. We build throughout the state of Victoria (and SA/NSW border areas). We offer our rammed earth construction services for domestic, commercial and landscaping projects. What is it like working with Rammed Earth Enterprises? We begin the process with a preliminary consultation to discuss the design and construction of your earth walls. After the initial consultation, we will provide you with a quote. If there are any changes to your initial specifications, or you require further feedback/consultation on design, we are happy to assist. We will then provide you with a revised figure if required. Your rammed earth walls are then constructed and sealed. The slab/footings are marked out to indicate exactly where the rammed earth walls will be built. At this point, the articulation joints are also marked out. Articulation joints are vertical joins between wall panels. They to help control lineal shrinkage as the walls dry. They also assist in the prevention of cracks during slab/footing movement. Articulation joints are required in all masonry walls. We ensure that the overall look of the walls and floor plan is taken into consideration at this stage. Specialised formwork is then set up as marked. The formwork design allows them to be joined to increase the length of walls. The formwork height is in 300mm vertical increments. Water is then added to an earth/cement mixture to create a product that has the correct moisture level. The mixture is then used for the construction of the rammed earth walls. When the moisture level of the mix is correct, it is then hand shovelled into the formwork in 150mm deep increments. It is then compacted with pneumatic tampers. This process is repeated to complete the wall. Typically we leave the walls in-form overnight prior to removing the formwork. The formwork is then removed or ‘stripped-down’, and the walls are detailed as required. They are left to cure out of form – then they are ready to be sealed. Curing/drying times can differ, depending on the wall and weather. Because our rammed earth walls are built to an off-form finish, after they have been sealed, the walls are complete. They will not need any maintenance/re-sealing inside. Outside they will only need to be re-sealed approximately every 15 – 20 years. Want to learn more? We have written a detailed blog on how we build our Rammed Earth walls. The construction process for rammed earth walls is unique. It’s different from traditional wall-building mediums. Because of this, there are certain things we require on-site to build. If the following are not available, please notify us so we are able to make alternative arrangements. Water – availability on site. 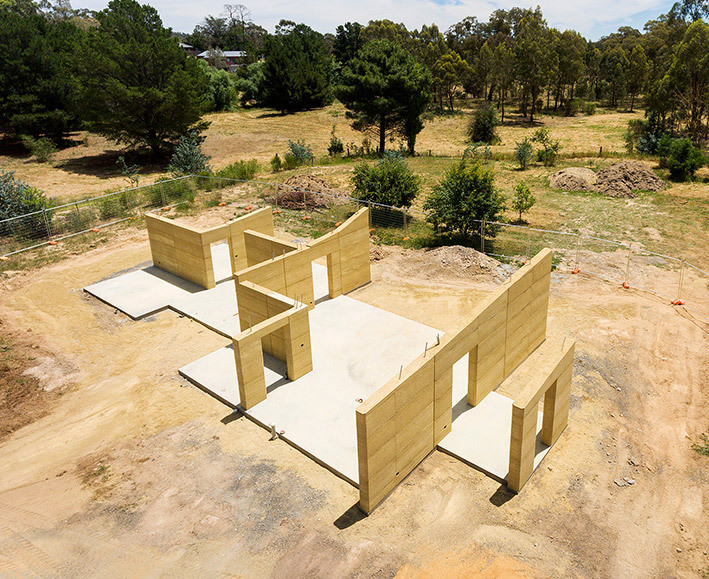 Site Access – ensure there is adequate space for the storage of materials and equipment to construct your rammed earth walls. We have been working with clients since 1992 to create quality rammed earth structures. We would love to discuss how we can help with the construction of your unique rammed earth walls.